DETROIT (Bloomberg) -- Toyota Motor Corp. President Akio Toyoda said scrutiny from inside and outside the company has been a “good lesson” and expects the carmaker to emerge stronger after recalling millions of vehicles worldwide. The carmaker is working to rebuild its reputation after recalling more than 8 million vehicles worldwide for defects linked to unintended acceleration. 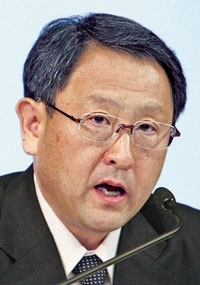 Toyoda, 54, who replaced Katsuaki Watanabe as president almost a year ago, has said the problems may have been connected to the company’s rapid expansion in recent years, as it ascended to the top of the industry. Toyota was fined after it fixed gas pedals in Europe months before the same change was offered for cars in the U.S. The automaker’s recalls for pedals and floor mats that held down accelerators triggered four U.S. Congressional hearings, including one in February attended by Toyoda and other top executives, and the latest on May 20. The U.S. Transportation Department continues to investigate Toyota’s handling of past recalls. The National Highway Traffic Safety Administration, which fined Toyota the maximum $16.4 million last month for failing to promptly notify the agency about defects tied to unintended acceleration, earlier this month opened an investigation into a 2005 recall for faulty truck steering-relay rods. “Customer safety is a concern we share with NHTSA and we will continue to cooperate fully,” Toyoda said. The company has formed a global quality committee, headed by Toyoda, which held its first meeting on March 30. It is also establishing new technology centers globally to gather local information on suspected quality problems and quicken decision- making on recalls. Lost sales due to the recalls for the fiscal year ended in March amounted to about 50,000 vehicles, compared with an earlier estimate of 100,000, Toyota Senior Managing Director Takahiko Ijichi said on May 12. Toyota’s U.S. sales rose 24 percent in April after the automaker added discounts across its lineup. Still, the Japanese carmaker must fend off increasing competition in the U.S. from Ford Motor Co. and Hyundai Motor Co.’s new models, said Jessica Caldwell, senior analyst at Edmunds.com., an auto industry researcher in Santa Monica, Calif. Sales of Hyundai’s revamped Sonata sedan, which was introduced in the U.S. in February, soared 57 percent in April. The model competes with Toyota’s Camry, sales of which gained 10 percent last month. Ford’s April sales rose 25 percent. Separately, Toyota announced that it will acquire a $50 million stake in electric-car maker Tesla Motors Inc., maker of the $109,000 Roadster. Tesla will buy a Toyota joint-venture factory in California to build its Model S and other vehicles, Tesla CEO Elon Musk said yesterday. The companies will cooperate in developing electric cars, parts, production systems and engineering support, they said in a joint statement. The tie-up brings Toyota, the world’s biggest seller of hybrid autos, together with Tesla, the only company now selling U.S. highway-legal battery-powered cars. The deal may help Toyota compete with Nissan Motor Co. and General Motors Co. in selling electric cars in the U.S., where regulations are pushing them to offer low-emission vehicles. It may also boost Toyota’s image by reviving the New United Motor Manufacturing Inc. joint-venture plant, closed in April, in Fremont, California. The reopening of NUMMI, for 25 years a joint venture between Toyota and the former General Motors Co., may eventually create 10,000 jobs, Musk said.